As all the world knows by now, Yuri Milner, the Russian billionaire Internet investor, and Stephen Hawking, the famed astrophysicist, have revealed plans for an interstellar mission, $100 million Breakthrough Starshot, that would launch chip-sized robotic probes at more than 25 percent the speed of light for 20-year journeys on the 25-trillion mile trip our nearest star system, Alpha Centauri. 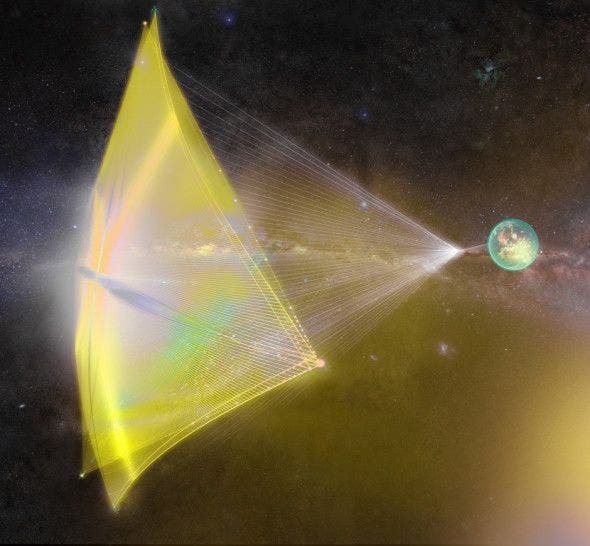 A huge ground-based laser will push the swarms of “laser sails” (up to tens of thousands of probes per year) propelled by light from the sun toward their exotic destination. Light exerts very little pressure, but prior projects have already successfully tested a number of solar sails — spacecraft propelled by light from the sun. As a prelude to the journey, Starshot could launch interplanetary missions to explore unsolved mysteries of our solar system — driving “space-chips” to Mars in roughly 30 minutes, or to the potential life bearing habitats of Enceladus, Titan, and Europa. 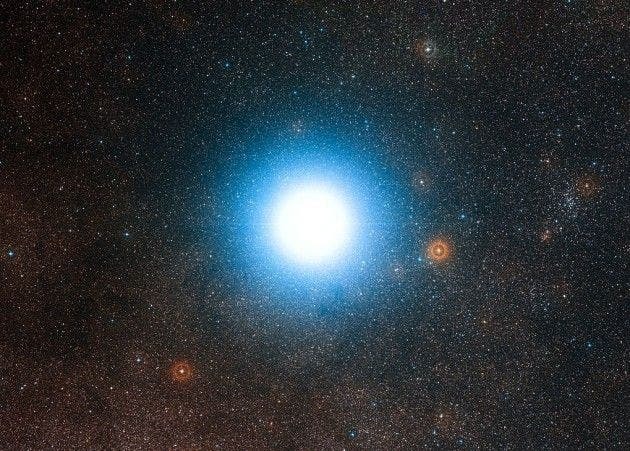 Scientists estimate the orange dwarf Alpha Centauri B system is slightly older than our 4.6-billion-year old solar system at anywhere from 4.8 billion to 6.5 billion years old. If life on a planet or moon in the habitable zone of Alpha Centauri B evolved similarly as it did on Earth, then primitive forms of life could already have flourished there when the young Earth collided with a Mars-sized object, forming our moon. Loeb said that Starshot will be able to rapidly explore the Solar System. “Just to give you an example, to get to Pluto it would take three days instead of the 9½ years it took New Horizons to get there. If we launch at a fifth of the speed of light, it’ll get there the same week,” he said. The seminal “Open Letter,” the Alpha Centauri Manifesto, below, lays down the foundational thinking behind the Breakthrough project. The story of humanity is a story of great leaps – out of Africa, across oceans, to the skies and into space. Since Apollo 11’s ‘moonshot’, we have been sending our machines ahead of us – to planets, comets, even interstellar space. A mature civilization, like a mature individual, must ask itself this question. Is humanity defined by its divisions, its problems, its passing needs and trends? Or do we have a shared face, turned outward to the Universe? In 1990, Voyager 1 swiveled its camera and captured the ‘Pale Blue Dot’ – an image of Earth from six billion kilometers away. It was a mirror held up to our planet – home of water, life, and minds. A reminder that we share something precious and rare. But how rare, exactly? The only life? The only minds? That means the search for life is the ultimate ‘win-win’ endeavor. All we have to do is take part. Today we have search tools far surpassing those of previous generations. Telescopes can pick out planets across thousands of light years. The magic of Moore’s law lets our computers sift data orders of magnitude faster than older mainframes – and ever quicker each year. But with current rocket propulsion technology, it would take tens or hundreds of millennia to reach our neighboring star system, Alpha Centauri. The stars, it seems, have set strict bounds on human destiny. Until now. In the last decade and a half, rapid technological advances have opened up the possibility of light-powered space travel at a significant fraction of light speed. This involves a ground-based light beamer pushing ultra-light nanocrafts – miniature space probes attached to lightsails – to speeds of up to 100 million miles an hour. Such a system would allow a flyby mission to reach Alpha Centauri in just over 20 years from launch, and beam home images of possible planets, as well as other scientific data such as analysis of magnetic fields. 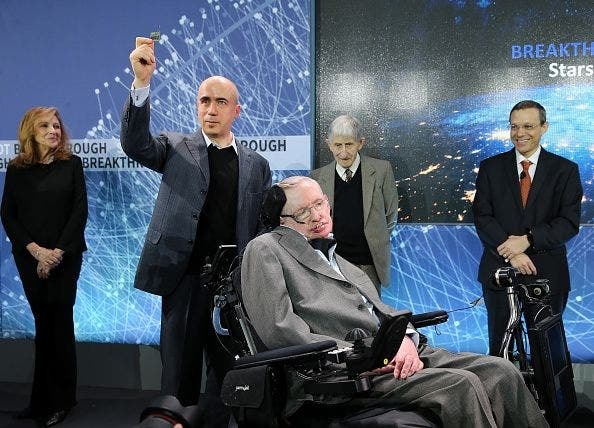 January 2016 also saw ‘first light’ for Breakthrough Listen, with observations marking the start of the 10-year effort announced in July 2015 at London’s Royal Society by Yuri Milner, Stephen Hawking, Lord Martin Rees, Ann Druyan, and Frank Drake. Hundreds of hours of observations have taken place using the Green Bank Radio Telescope in West Virginia and Lick Observatory’s Automated Planet Finder in Mt. Hamilton, California. Breakthrough Listen is the largest ever scientific research program aimed at finding evidence of civilizations beyond Earth. The scope and power of the search are on an unprecedented scale: The program includes a survey of the 1,000,000 closest stars to Earth. It scans the center of our galaxy and the entire galactic plane. Beyond the Milky Way, it listens for messages from the 100 closest galaxies to ours. They are also carrying out the deepest and broadest ever search for optical laser transmissions. These spectroscopic searches are 1000 times more effective at finding laser signals than ordinary visible light surveys. They could detect a 100 watt laser (the energy of a normal household bulb) from 25 trillion miles away. Breakthrough Listen is releasing the first batch of data for public access at the Breakthrough Initiatives website. Data from the Green Bank Telescope is also available to users of UC Berkeley’s SETI@home software.